With a new ergonomic construction for enhanced core support, body lift, stability, and comfort, the suit helps swimmers keep optimum shape in the water. Greater core and leg compression give this suit it' s power while the flatlock seams give it its "perfect fit" feel. The fabrics are chlorine resistant and provide protection against ultraviolet rays (50+ UPF). 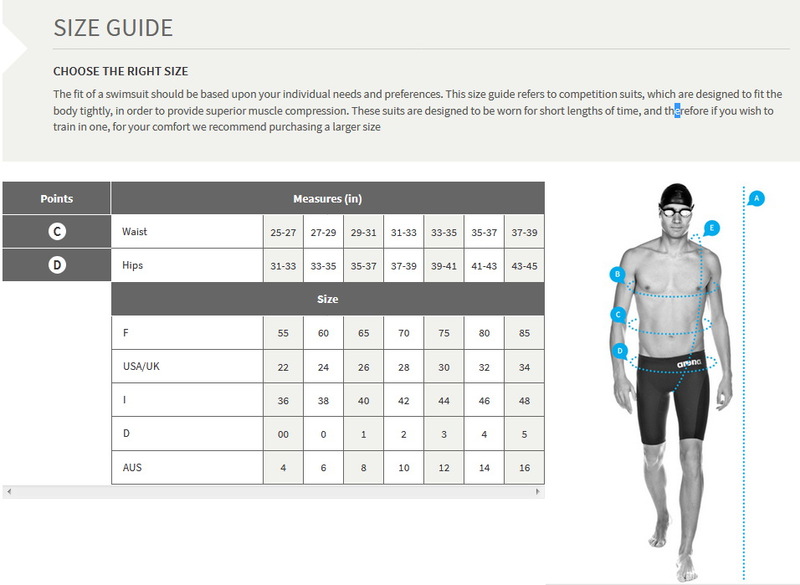 E - Body length: In a loop, measure from the highest part of the shoulder, beneath the crotch and then back to the starting point. Great suit. My son had the first version of this suit and wore a size 24, which fit perfectly. Version 2.0 fits much larger. We ordered a 24 and it was huge. We sent it back and exchanged it for a size 22 and it is still a little too big. Since a 22 is the smallest size in this suit, we are keeping it and waiting for him to grow into in.